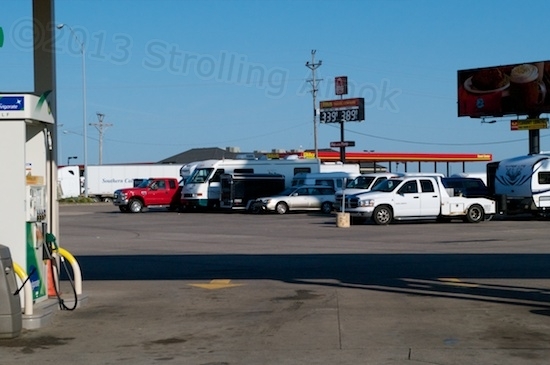 Notice the motley assortment of overnight “RV” types. Well, the Marengo campground became just a memory as I rolled toward Iowa late in the day. I had to wait for an 8-pound shipment of Benchmark recreational atlases to show up at my “home” address, and didn’t get going until 5 PM for a 3-hour drive. I overnighted at The I-80 Truck Stop, “The World’s Largest”, and although the semi traffic noise was nonstop, I did manage to get some sleep. Because it was 8 PM when I pulled in, I broke my own rule about not eating meals out and had a club sandwich in their restaurant, since I had eaten little during the day and my meal prep time would be awhile. That was good news/bad news. The meal, with tip, set me back $15. Even a grilled cheese sandwich is $8 here! To compensate for that, my sandwich was huge. It looked like a Dagwood sandwich and took some careful holding to avoid exploding. Also, it was superb. 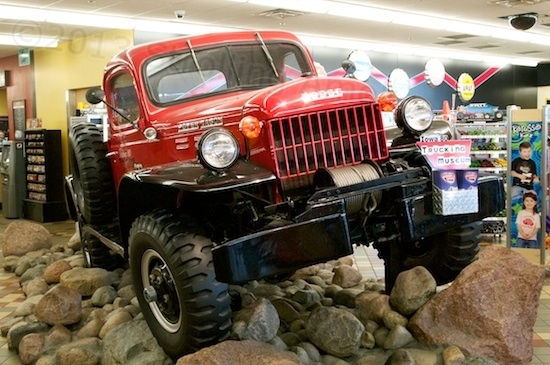 An old Dodge Power Wagon resides in the lobby. 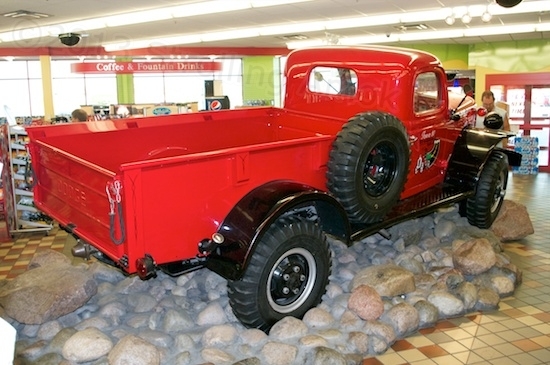 This place is family-owned, and it shows in that there’s an old Dodge Power Wagon in the lobby and a Ford Model T truck in the restaurant. The gigantic truck accessories area contains a semi tractor and a full rig inside that, both duded up with paint schemes and add-on geegaws. Across the way is a huge building called the truck museum, housing REO and other trucks back to 1910. They like trucks here. The elaborate rock layout is very nicely done, with everything mortared together. Steel stands support the weight of the truck, not the tires. Today I continue westward toward the Bonneville Salt Flats, many days away. It’s many days away mainly because I’m only driving 3-5 hours each day in order to enjoy the trip and reduce wear and tear – on me. I have to admit, that club sandwich of theirs was a touch better than any I’d tasted, which is quite a few.